Echinacea does not appear to prevent the common cold, but it may shorten the duration of colds or be of benefit in the early treatment of influenza when taken within 24–48 hours of the first symptoms. Echinacea extract appears to stimulate immune cells in laboratory and animal studies. Some compounds found in echinacea appear to reduce inflammation, relieve pain, and kill bacteria and viruses directly. Human studies have found that echinacea is not effective for preventing the common cold or to treat respiratory infections, but it may shorten the duration of colds. One large clinical trial suggested a specific echinacea formulation was as effective as a prescription drug to treat influenza, with fewer side effects. Few studies have been conducted on echinacea with respect to cancer or cancer treatment. Some studies suggest that echinacea could alter the effectiveness of some anticancer drugs or cause adverse effects. Most studies do not support this use. One clinical trial supports the use of echinacea for reducing the length of colds, but not the severity of symptoms. One large trial suggests a specific echinacea formulation could be as effective as a prescription drug to treat influenza, with fewer side effects. Laboratory studies suggest that echinacea has antibacterial qualities. Laboratory and animal studies suggest that echinacea extracts stimulate different parts of the immune system. Human studies suggest immune-changing effects. Laboratory studies suggest that echinacea has antiviral properties and a human study suggests a specific echinacea formulation could be as effective as a prescription drug to treat the influenza virus. Animal models suggest wound-healing properties, but studies have not been conducted in humans. You are taking immunosuppressants (eg, tacrolimus, cyclosporine): Echinacea may lessen their effect. You are taking drugs that are substrates of cytochrome P450: Echinacea may increase the risk of side effects of these drugs. You are taking tamoxifen: Lab studies suggest echinacea may weaken the effects of tamoxifen. You are taking etoposide: Echinacea caused low blood platelets in a patient receiving etoposide. You are taking P-glycoprotein (P-gp) substrate drugs: Lab studies suggest echinacea could alter effectiveness of some of these drugs. You are taking oseltamivir: Lab studies showed that echinacea reduced the active formation of this drug, and may therefore reduce effectiveness. You are undergoing eyelid surgery: Echinacea increases the risk of dry eye syndrome. You have allergies or asthma: Allergic reactions have been reported with echinacea. You are pregnant or nursing: Echinacea has not been adequately studied in pregnant women. Worsening of a chronic blistering skin disease: In a 55-year-old man with a history of pemphigus vulgaris, which was controlled with immunosuppressants. Only partial remission was reported after he was treated again with immunosuppressants. Reduced white blood cell count: In a 51-year-old woman following chronic use of echinacea. Her white blood cell count returned to normal levels 7 months after discontinuing echinacea supplements. Severe hepatitis: In a 45-year-old man who complained of fatigue and jaundice lasting one week, linked to daily high doses of echinacea used to strengthen his immune system after catching the cold. Increased eosinophil count in the bloodstream: In a 58-year-old man, there was an increase in this type of white blood cell following use of echinacea. His symptoms improved after discontinuing echinacea. Low platelet and blood-coagulation disorders: Two case reports involve a 61-year-old cancer patient whose use of echinacea likely interacted with etoposide, and a 32-year-old man who used echinacea to alleviate respiratory symptoms. Severe acute liver failure: In a 2-year-old girl, likely cause by echinacea toxicity. Eye irritation and conjunctivitis: 7 reports following use of topical echinacea were received by The National Registry of Drug-Induced Ocular Side Effects. Symptoms resolved after discontinuing echinacea. Echinacea supplements available in stores contain varying amounts and different species of echinacea. Therefore, the beneficial results seen with echinacea in clinical trials may not apply to a product that contains a different species or quality of this herb. One study found that about half of the echinacea brands tested did not contain the type or quality of echinacea that they claimed on the label. The genus Echinacea belongs to the family Compositae, commonly referred to as the sunflower family. Of the known species, E. purpurea, E. angustifolia, and E. pallida are commonly used in herbal medicine. Extracts derived from the root and aerial parts are widely used in Europe and the United States as nonspecific immunostimulants and to prevent or treat the common cold and influenza. However, natural products differ greatly in composition (26), mainly due to the use of different species, variable plant materials or extraction methods, and the addition of other components. In vitro and in vivo studies suggest immunostimulatory and anti-inflammatory effects (27). A standardized echinacea preparation inactivated influenza viruses (28) and may improve respiratory activity (2) (3). In animal models, echinacea stimulated erythropoiesis, increased blood-oxygen transport (29) (30), produced anxiolytic effects (31), and exhibited wound-healing properties (32) (33) (34). Clinical data indicate that echinacea is ineffective in preventing the common cold caused by rhinoviruses (4) or in treating upper respiratory infections (5) (6) (16). Studies of its ability to reduce incidence and duration of the common cold yielded mixed results (7) (8) (9) (10) (22) (35) (36). Other analyses do not indicate any benefits for treating colds, and weak evidence for a prophylactic benefit (26) (37), but a large randomized trial found an echinacea formulation to be as effective as oseltamivir for influenza, and with fewer adverse events in the echinacea group (38). Small studies have shown that a standardized echinacea root extract has immunomodulating activity (39); and an echinacea/sage spray was useful in treating acute sore throats (17). Preliminary data on improving or enhancing athletic performance are mixed (40) (41). 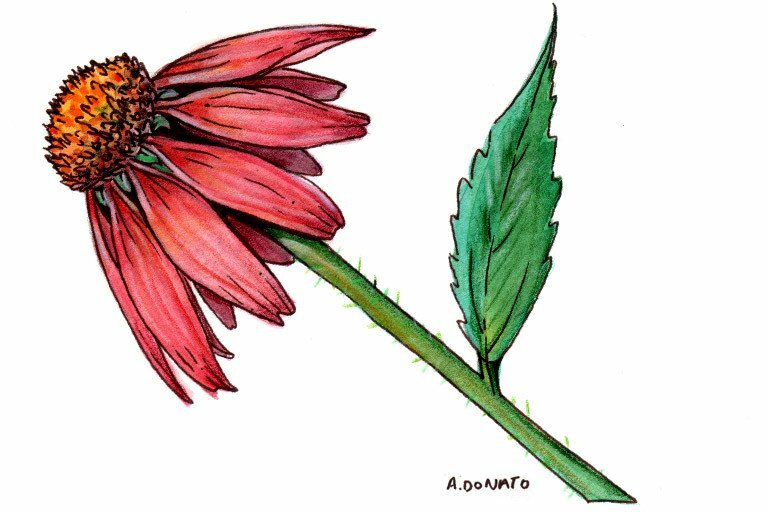 But a topical echinacea extract was reported effective in alleviating symptoms associated with atopic eczema (63). Echinacea may also have anticancer potential evidenced by the cytotoxic effects exerted by an extract and a major compound, cichoric acid, in human colon cancer cells (42). Some studies suggest that echinacea could decrease plasma levels, affect therapeutic efficacy, or cause adverse effects with some anticancer drugs (25) (43). In HIV-infected patients, co-administration with etravirine was found to be safe and well tolerated (44). In a large population-based study, use of echinacea was associated with a slight increase in diastolic blood pressure (45). There is insufficient evidence regarding the efficacy and safety of echinacea during pregnancy (46). Echinacea’s active constituents include cichoric and caftaric acids, polysaccharides, and alkylamides (47). Immune-modulating effects of a standardized echinacea root extract include upregulation of interleukin (IL)-2 and IL-8 and downregulation of pro-inflammatory cytokines tumor necrosis factor (TNF)-alpha and IL-6 (39). Immunemodulation by alkylamides occurs through binding to human cannabinoid receptors 1 and 2, and by inhibiting TNF-alpha (48). Alkylamides may also be responsible for anti-inflammatory effects (27). Although echinacea does not appear to have significant ergogenic or anabolizing effects, it appears to enhance the immune system and decrease oxidative damage (49). In vitro and in vivo, echinacea extracts were shown to stimulate phagocytosis, enhance mobility of leukocytes, stimulate TNF and IL-1 secretion from macrophages and lymphocytes, and improve respiratory activity (2) (3). However, their effects on innate immunity such as phagocytosis could not be confirmed, and showed only minimal effects on tumor progression, although echinacea did stimulate natural killer cell activity (50). Other studies suggest that bacterial components of echinacea are responsible for immune benefits, as total bacterial load differences and content of bacterial lipopolysaccharides within echinacea samples have correlated with NF-kappaB activation in THP-1 cells (51). In human colon cancer cells, cichoric acid decreased telomerase activity and induced apoptosis via DNA fragmentation, caspase-9 activation, poly-ADP-ribose polymerase (PARP) cleavage and beta-catenin downregulation (42). Differential effects of echinacea on intestinal and hepatic CYP3A activities may be due to systemic unavailability of locally-acting constituents that inhibit CYP3A, or rapid absorption of these constituents that limits intestinal exposure and CYP3A induction, or a systemically-formed constituent metabolite that is capable of inducing hepatic but not intestinal CYP3A (52). Patients undergoing chemotherapy should use caution with echinacea, as it may reduce the efficacy of some anticancer medications or cause adverse effects (25) (43) (53). Patients with allergies or asthma should exercise caution with echinacea, as allergic reactions have been reported (54). Patients undergoing blepharoplasty (eyelid surgery), should avoid echinacea because of added increased risk of dry eye syndrome (55). Profound thrombocytopenia: In a 61-year-old man with nonsmall cell lung cancer who was concurrently taking echinacea while receiving chemoradiation with cisplatin and etoposide (25). Severe thrombotic thrombocytopenic purpura (TTP): In a 32-year-old man following ingestion of echinacea to alleviate upper respiratory tract infection symptoms. TTP resolved after treatment for a month (18). Pemphigus vulgaris exacerbation: In a 55-year-old man with a history of the condition which was controlled with immunosuppressants. Exacerbation was linked to consumption of echinacea, and only partial remission was regained after he was treated again with immunosuppressants (19). Asymptomatic leukopenia: In a 51-year-old woman following chronic use of echinacea. Her white blood cell count returned to normal levels 7 months after discontinuing echinacea supplements (20). Severe acute hepatitis: In a 45-year-old man who complained of fatigue and jaundice lasting one week, linked to the ingestion of daily high doses of echinacea used to strengthen his immune system after catching the cold (23). Severe acute liver failure: In a 2-year-old girl, likely secondary to echinacea toxicity (56). Hypereosinophilia: In a 58-year-old man following echinacea consumption, with symptoms improving after discontinuing echinacea (24). Bilateral central facial palsy and severe quadriparesis: In a 25 year-old male after taking herbal drugs (containing echinacea and many other herbal ingredients) for two weeks. Symptoms improved after conventional treatment (64). Acute cholestatic hepatitis: In a 41-year-old man following consumption of echinacea to strengthen immune system. His condition improved after discontinuing its use (65). Eye irritation and conjunctivitis: 7 reports following use of topical echinacea were received by The National Registry of Drug-Induced Ocular Side Effects. Symptoms resolved after discontinuing echinacea (21). Cytochrome P450 substrates: Echinacea inhibits CYP3A4 (14) (43) and CYP2C8 (66) and can affect the intracellular concentration of drugs metabolized by this enzyme. Cytochrome P3A or CYP1A2 substrate drugs: Caution should be used when echinacea is coadministered with drugs dependent on CYP3A or CYP1A2 for their elimination (57). Tamoxifen: In vitro studies suggest concurrent echinacea use may result in subtherapeutic systemic exposure of prodrugs such as tamoxifen, reducing their efficacy (43). Docetaxel: In a study of cancer patients receiving docetaxel, echinacea at the recommended dosage did not significantly alter docetaxel pharmacokinetics (58) (59). Etoposide: Echinacea caused profound thrombocytopenia in a patient receiving etoposide, likely due to the inhibition of CYP3A4 (25). P-glycoprotein (P-gp) substrate drugs: In vitro, echinacea has been shown to inhibit P-gp activity (60), but the clinical significance of this is uncertain as echinacea supplementation in humans did not affect digoxin pharmacokinetics (61). Oseltamivir: In vitro, echinacea reduced the formation of the active drug and may therefore reduce efficacy, but clinical significance is as yet undetermined (62). Immunosuppressants: Echinacea may antagonize the effects of immunosuppressants (19). Gilroy CM, Steiner JF, Byers T, Shapiro H, Georgian W. Echinacea and truth in labeling. Arch Intern Med 2003;163:699-704. Melchart D, Clemm C, Weber B, et al. Polysaccharides isolated from Echinacea purpurea herba cell cultures to counteract undesired effects of chemotherapy-a pilot study. Phytotherapy Res 2002;16:138-42. Groom SN, Johns T, Oldfield PR. The potency of immunomodulatory herbs may be primarily dependent upon macrophage activation. J Med Food. Mar 2007;10(1):73-79. Turner RB, Bauer R, Woelkart K, Hulsey TC, Gangemi JD. An Evaluation of Echinacea angustifolia in Experimental Rhinovirus Infections. N Engl J Med. 2005;353(4):341-348. Taylor JA, Weber W, Standish L, et al. Efficacy and Safety of Echinacea in Treating Upper Respiratory Tract Infections in Children: A Randomized Controlled Trial. JAMA 2003;290:2824-30. Yale SH, Liu K. Echinacea purpurea Therapy for the Treatment of the Common Cold. Arch Intern Med. 2004;164:1237-1241. Shah SA, Sander S, White CM, Rinaldi M, Coleman CI. Evaluation of echinacea for the prevention and treatment of the common cold: a meta-analysis. Lancet Infect Dis 2007;7(7):473-80. Schulten B, Bulitta M, Ballering-Bruhl B, Koster U, Schafer M. Efficacy of Echinacea purpurea in patients with a common cold. A placebo-controlled, randomized, double-blind clinical trial. Arzneimittelforschung 2001;51:563-8. Melchart D, Linde K, Fischer P, Kaesmayr J. Echinacea for preventing and treating the common cold. Cochrane Database Syst Rev 2001;4:1-15. Linde K, Barrett B, Wolkart K, Bauer R, Melchart D. Echinacea for preventing and treating the common cold. Cochrane Database Syst Rev. 2006;(1):CD000530. Giles JT, Palat CT, 3rd, Chien SH, Chang ZG, Kennedy DT. Evaluation of echinacea for treatment of the common cold. Pharmacotherapy 2000;20:690-7. Newall C, et al. Herbal Medicines: A Guide for Health-care Professionals. 1st ed. London: Pharmaceutical Press; 1996. Scott GN, Elmer GW. Update on natural product-drug interactions. Am J Health-Syst Pharm 2002;59:339-47. O’Neil J, Hughes S, Lourie A, Zweifler J. Effects of echinacea on the frequency of upper respiratory tract symptoms: a randomized, double-blind, placebo-controlled trial. Ann Allergy Asthma Immunol. 2008 Apr;100(4):384-8. Schapowal A, Berger D, Klein P, Suter A. Echinacea/sage or chlorhexidine/lidocaine for treating acute sore throats: a randomized double-blind trial. Eur J Med Res. 2009 Sep 1;14(9):406-12. Liatsos G, Elefsiniotis I, Todorova R, Moulakakis A. Severe thrombotic thrombocytopenic purpura (TTP) induced or exacerbated by the immunostimulatory herb Echinacea. Am J Hematol. 2006 Mar;81(3):224. Lee AN, Werth VP. Activation of autoimmunity following use of immunostimulatory herbal supplements. Arch Dermatol. 2004 Jun;140(6):723-7. Kemp DE, Franco KN. Possible leukopenia associated with long-term use of echinacea. J Am Board Fam Pract. 2002 Sep-Oct;15(5):417-9. Fraunfelder FW. Ocular side effects from herbal medicines and nutritional supplements. Am J Ophthalmol. 2004 Oct;138(4):639-47. Barrett B, Brown R, Rakel D, et al. Echinacea for treating the common cold: a randomized trial. Ann Intern Med. 2010 Dec 21;153(12):769-77. Kocaman O, Hulagu S, Senturk O. Echinacea-induced severe acute hepatitis with features of cholestatic autoimmune hepatitis. Eur J Intern Med. 2008 Mar;19(2):148. Maskatia ZK, Baker K. Hypereosinophilia associated with echinacea use. South Med J. 2010 Nov;103(11):1173-4. Bossaer JB, Odle BL. Probable etoposide interaction with Echinacea. J Diet Suppl. 2012 Jun;9(2):90-5. Goey AK, Rosing H, Meijerman I, et al. The bioanalysis of the major Echinacea purpurea constituents dodeca-2E,4E,8Z,10E/Z-tetraenoic acid isobutylamides in human plasma using LC-MS/MS. J Chromatogr B Analyt Technol Biomed Life Sci. Aug 1 2012;902:151-156. Pleschka S, Stein M, Schoop R, et al. Anti-viral properties and mode of action of standardized Echinacea purpurea extract against highly pathogenic avian influenza virus (H5N1, H7N7) and swine-origin H1N1 (S-OIV). Virol J. 2009;6:197. Goel V, Chang C, Slama JV, et al. Alkylamides of Echinacea purpurea stimulate alveolar macrophage function in normal rats. Int Immunopharmacol. Feb 2002;2(2-3):381-387. O’Neill W, McKee S, Clarke AF. Immunological and haematinic consequences of feeding a standardised Echinacea (Echinacea angustifolia) extract to healthy horses. Equine Vet J. May 2002;34(3):222-227. Haller J, Freund TF, Pelczer KG, et al. The anxiolytic potential and psychotropic side effects of an echinacea preparation in laboratory animals and healthy volunteers. Phytother Res. Jan 2013;27(1):54-61. Dogan Z, Ergul B, Sarikaya M, et al. The antioxidant effect of Echinacea angustifolia and Echinacea purpurea in rat colitis model induced by acetic acid. Bratisl Lek Listy. 2014;115(7):411-415. Pazyar N, Yaghoobi R, Rafiee E, et al. Skin wound healing and phytomedicine: a review. Skin Pharmacol Physiol. 2014;27(6):303-310. Zhai Z, Haney DM, Wu L, et al. Alcohol extract of Echinacea pallida reverses stress-delayed wound healing in mice. Phytomedicine. Jun 2009;16(6-7):669-678. Allan GM, Arroll B. Prevention and treatment of the common cold: making sense of the evidence. Cmaj. Feb 18 2014;186(3):190-199. Fashner J, Ericson K, Werner S. Treatment of the common cold in children and adults. Am Fam Physician. Jul 15 2012;86(2):153-159. Karsch-Volk M, Barrett B, Linde K. Echinacea for preventing and treating the common cold. Jama. Feb 10 2015;313(6):618-619. Raus K, Pleschka S, Klein P, et al. Effect of an Echinacea-Based Hot Drink Versus Oseltamivir in Influenza Treatment: A Randomized, Double-Blind, Double-Dummy, Multicenter, Noninferiority Clinical Trial. Curr Ther Res Clin Exp. Dec 2015;77:66-72. Dapas B, Dall’Acqua S, Bulla R, et al. Immunomodulation mediated by a herbal syrup containing a standardized Echinacea root extract: a pilot study in healthy human subjects on cytokine gene expression. Phytomedicine. Sep 25 2014;21(11):1406-1410. Whitehead MT, Martin TD, Scheett TP, et al. Running economy and maximal oxygen consumption after 4 weeks of oral Echinacea supplementation. J Strength Cond Res. Jul 2012;26(7):1928-1933. Baumann CW, Bond KL, Rupp JC, et al. Echinacea purpurea supplementation does not enhance VO2max in distance runners. J Strength Cond Res. May 2014;28(5):1367-1372. Tsai YL, Chiu CC, Yi-Fu Chen J, et al. Cytotoxic effects of Echinacea purpurea flower extracts and cichoric acid on human colon cancer cells through induction of apoptosis. J Ethnopharmacol. Oct 11 2012;143(3):914-919. Grappe F, Nance G, Coward L, et al. In vitro inhibitory effects of herbal supplements on tamoxifen and irinotecan metabolism. Drug Metabol Drug Interact. 2014;29(4):269-279. Molto J, Valle M, Miranda C, et al. Herb-drug interaction between Echinacea purpurea and etravirine in HIV-infected patients. Antimicrob Agents Chemother. Oct 2012;56(10):5328-5331. McCarty CA, Berg RL, Rottscheit CM, et al. The use of dietary supplements and their association with blood pressure in a large Midwestern cohort. BMC Complement Altern Med. 2013;13:339. Dante G, Bellei G, Neri I, et al. Herbal therapies in pregnancy: what works? Curr Opin Obstet Gynecol. Apr 2014;26(2):83-91. Zadoyan G, Fuhr U. Phenotyping studies to assess the effects of phytopharmaceuticals on in vivo activity of main human cytochrome p450 enzymes. Planta Med. Sep 2012;78(13):1428-1457. Gertsch J, Schoop R, Kuenzle U, et al. Echinacea alkylamides modulate TNF-alpha gene expression via cannabinoid receptor CB2 and multiple signal transduction pathways. FEBS Lett. Nov 19 2004;577(3):563-569. Amico AP, Terlizzi A, Damiani S, et al. Immunopharmacology of the main herbal supplements: a review. Endocr Metab Immune Disord Drug Targets. Dec 2013;13(4):283-288. Vetvicka V, Vetvickova J. Natural immunomodulators and their stimulation of immune reaction: true or false? Anticancer Res. May 2014;34(5):2275-2282. Pugh ND, Jackson CR, Pasco DS. Total bacterial load within Echinacea purpurea, determined using a new PCR-based quantification method, is correlated with LPS levels and in vitro macrophage activity. Planta Med. Jan 2013;79(1):9-14. Hermann R, von Richter O. Clinical evidence of herbal drugs as perpetrators of pharmacokinetic drug interactions. Planta Med. Sep 2012;78(13):1458-1477. Mooiman KD, Maas-Bakker RF, Moret EE, et al. Milk thistle’s active components silybin and isosilybin: novel inhibitors of PXR-mediated CYP3A4 induction. Drug Metab Dispos. Aug 2013;41(8):1494-1504. Askeroglu U, Alleyne B, Guyuron B. Pharmaceutical and herbal products that may contribute to dry eyes. Plast Reconstr Surg. Jan 2013;131(1):159-167. Lawrenson JA, Walls T, Day AS. Echinacea-induced acute liver failure in a child. J Paediatr Child Health. Oct 2014;50(10):841. Gorski JC, Huang SM, Pinto A, et al. The effect of echinacea (Echinacea purpurea root) on cytochrome P450 activity in vivo. Clin Pharmacol Ther. Jan 2004;75(1):89-100. Goey AK, Meijerman I, Rosing H, et al. The effect of Echinacea purpurea on the pharmacokinetics of docetaxel. Br J Clin Pharmacol. Sep 2013;76(3):467-474. Mooiman KD, Maas-Bakker RF, Hendrikx JJ, et al. The effect of complementary and alternative medicines on CYP3A4-mediated metabolism of three different substrates: 7-benzyloxy-4-trifluoromethyl-coumarin, midazolam and docetaxel. J Pharm Pharmacol. Jun 2014;66(6):865-874. Meng Q, Liu K. Pharmacokinetic interactions between herbal medicines and prescribed drugs: focus on drug metabolic enzymes and transporters. Curr Drug Metab. 2014;15(8):791-807. Gurley BJ, Swain A, Williams DK, et al. Gauging the clinical significance of P-glycoprotein-mediated herb-drug interactions: comparative effects of St. John’s wort, Echinacea, clarithromycin, and rifampin on digoxin pharmacokinetics. Mol Nutr Food Res. Jul 2008;52(7):772-779. Liu R, Tam TW, Mao J, et al. The effect of natural health products and traditional medicines on the activity of human hepatic microsomal-mediated metabolism of oseltamivir. J Pharm Pharm Sci. 2010;13(1):43-55. Oláh A, Szabó-Papp J, Soeberdt M, Knie U, Dähnhardt-Pfeiffer S, Abels C, Bíró T. Echinacea purpurea-derived alkylamides exhibit potent anti-inflammatory effects and alleviate clinical symptoms of atopic eczema. J Dermatol Sci. 2017 Oct;88(1):67-77. Kaymakamzade B, Karabudak R, Kurne AT, Nurlu G. Acute Disseminated Encephalomyelitis after Oral Therapy with Herbal Extracts: A Case Report. Balkan Med J. 2016 May;33(3):366-9. Gabranis I, Koufakis T, Papakrivos I, Batala S. Echinacea-associated acute cholestatic hepatitis. J Postgrad Med. 2015 Jul-Sep;61(3):211-2. Muthiah YD, Ong CE, Sulaiman SA, Ismail R. Inhibition of Human Cytochrome P450 2c8-catalyzed Amodiaquine N-desethylation: Effect of Five Traditionally and Commonly Used Herbs. Pharmacognosy Res. 2016 Oct-Dec;8(4):292-297.